There are too many emergency admissions to hospitals in England, according to the government spending watchdog. The National Audit Office says there were 5.3m such admissions in the last financial year - a 47% rise in 15 years - and many of these patients stayed in hospital for longer than necessary. It says it is "critical" for the NHS to do better in dealing with these issues to cope with rising winter pressures. NHS England says "big decisions" are needed to develop alternatives. The NAO report looks at how well emergency admissions to hospital are managed. These are admissions that are not planned, and happen at short notice because of the perceived clinical need. The report points out that, although admissions per head of population are lower in England than in Scotland and Wales, the rate of increase over the past decade has been much higher. A big factor is the growing proportion of patients attending major A&E departments who are admitted. Ten years ago it was fewer than one in five. Now it is more than one in four. But the NAO estimates that at least a fifth of patients admitted as emergencies could be managed outside hospital. It concludes that going to A&E and then being admitted has become the "default route" for urgent and emergency care. It also highlights growing delays in discharging patients once they are fit to leave hospital. It says these problems are a "major concern", partly because of cost to the NHS, but also because of the disruption they bring to hospitals and to patients. The report argues that all parts of the health system have a role in ensuring patients are treated in the most appropriate setting. It says primary, community and social care can manage long-term conditions better. It suggests ambulance services can take fewer patients to A&E, and it calls on hospitals to ensure senior doctors are on hand to help with early diagnosis and treatment. There is added urgency in these findings as the health service prepares for the increased pressures of winter. The director for acute episodes of care for NHS England, Prof Keith Willett, said the increase in emergency admissions was a growing concern. "As the report recommends, we must collectively take substantial steps to ensure patients receive the best possible care, preferably out of hospital but also when necessary in hospital," he said. "To achieve that it is clear the way we provide health and social care must change so our hospitals, GP and community services have the space to do that." 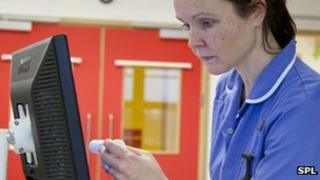 In a statement the College of Emergency Medicine welcomed the NAO report. "In particular the recognition that best practice includes consultant supervision of patient care within emergency departments echoes the college campaign to ensure every department has a minimum of 10 consultants." Health Secretary Jeremy Hunt said: "We know demand for A&E services is increasing as the population ages, with more people needing more healthcare. "That's why we are tackling both the short and long-term problems: transforming out of hospital care by reversing the disastrous changes to the 2004 GP contract, joining up the health and social care system, and backing A&Es with £250 million to prepare for this winter. "Winter is always tough, but the NHS has never been more prepared, and in the face of unprecedented demand A&E performance has never been stronger." For Labour, shadow health secretary Andy Burnham said the NHS was on the brink of a dangerous winter crisis. "This report is right to warn about the increasing numbers of elderly patients being admitted to England's A&Es," Mr Burnham said. "We have long warned ministers that severe cuts to council care services have left hospitals unable to discharge patients, and A&Es full to bursting."